John and Carol Farrell of Freeport, founders of the acclaimed Figures of Speech Theatre, are working with Bates students in a theater production workshop that will culminate in performances of the Asian folk tale Dragon’s Daughter at 7:30 p.m. Thursday through Saturday, May 20-22, and at 2 p.m. Sunday, May 23, in Gannett Theater, Pettigrew Hall, 305 College St. Performances are open to the general public for $6 and to seniors and students for $3. Tickets will be available from batestickets.com. For more information, please call 207-786-6161. The Farrells’ residency is made possible by the Freeman Foundation. The Farrells are internationally renowned for adapting folk tales in productions that make imaginative use of masks, puppetry and other traditional stage devices. 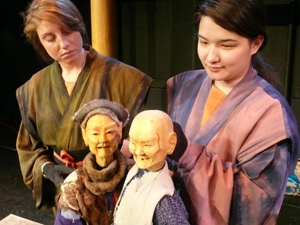 At Bates, they are conducting an intensive program in a variety of Asian performance genres including the “noh” style of musical theater and “bunraku” puppetry, both from Japan. They will direct Bates students in Dragon’s Daughter, which Figures of Speech premiered in 1997. Set upon an altar in an ancient temple, the production combines carved puppets with dynamic masked dance and storytelling. It’s the story of a young girl’s experiences as she seeks a secret lake that will save her village from drought. Since its founding, in 1982, Figures of Speech has celebrated the value of all cultures through the interplay of puppets, actors, shadows, music and masks. The company explores personal, social and spiritual issues with projects that quietly but emphatically illuminate our relationship to the earth and the balance between individual vision and community obligation. Figures of Speech has toured all over the world, from Bulgaria to Japan to Peru. Besides performing at venues such as the Kennedy Center, the Smithsonian Institution and the New Victory Theatre on Broadway, the company retains a strong commitment to teaching and performing in rural schools and theaters throughout its home state of Maine. 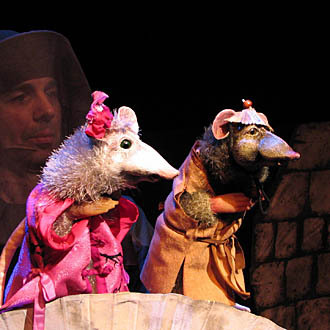 The company is a four-time recipient of the coveted UNIMA Citation of Excellence, the highest distinction in American puppet theater, as well as numerous grant awards from organizations including the National Endowment for the Arts, the Rockefeller Foundation, the Jim Henson Foundation and the New England Foundation for the Arts.